PTEROPODS- THE WORLDS SMALLEST OCEAN GLIDERS I analyze the geochemical signal of Ocean Acidification (OA) and Warming in the shells of Arctic pteropods during the last decade, a time period which has seen the most rapid and drastic change in Ocean Chemistry and Temperature in the Arctic (temperature has increased 0.8 °C). 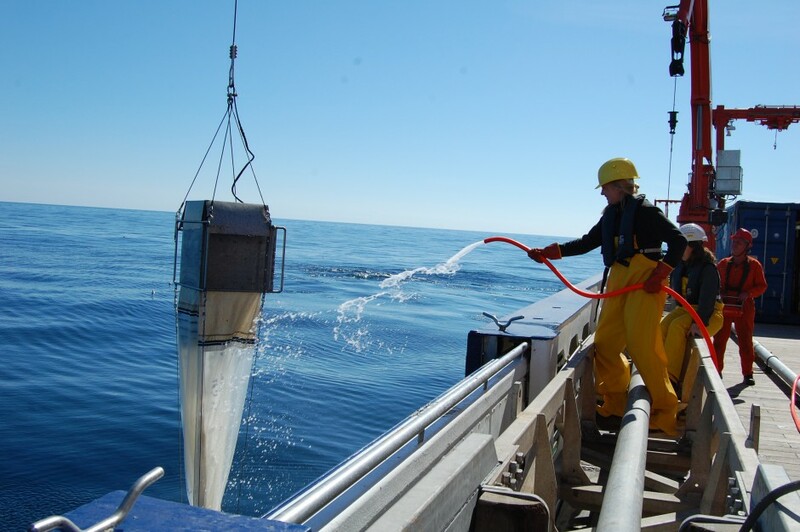 Pteropods were obtained from a 13-year sediment trap series located in an unique location in the Arctic, where both warmer, North-Atlantic waters as well as colder, Arctic waters are transported. Two different species of pteropods, Limacina helicina (Arctic) and Limacina retroversa (North Atlantic), present in these sediment traps, serve as ocean gliders: tracking the water conditions while being transported in the current. I am using a special setup, where a laser is used to drill small holes into the shells. The material extracted is then analyzed for its geochemical composition, which will then tell us something about OA and Ocean Warming from a pteropod perspective. 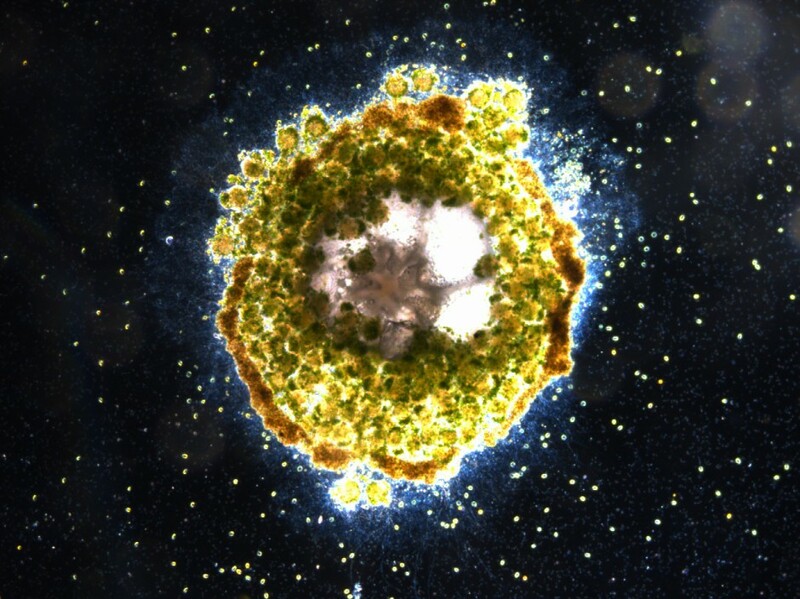 The picture on the top of this webpage shows an adult foram that underwent asexual reproduction and divided itsself into many, many genetically identical clones (bigger green dots, the tiny green dots are algae the forams eat). 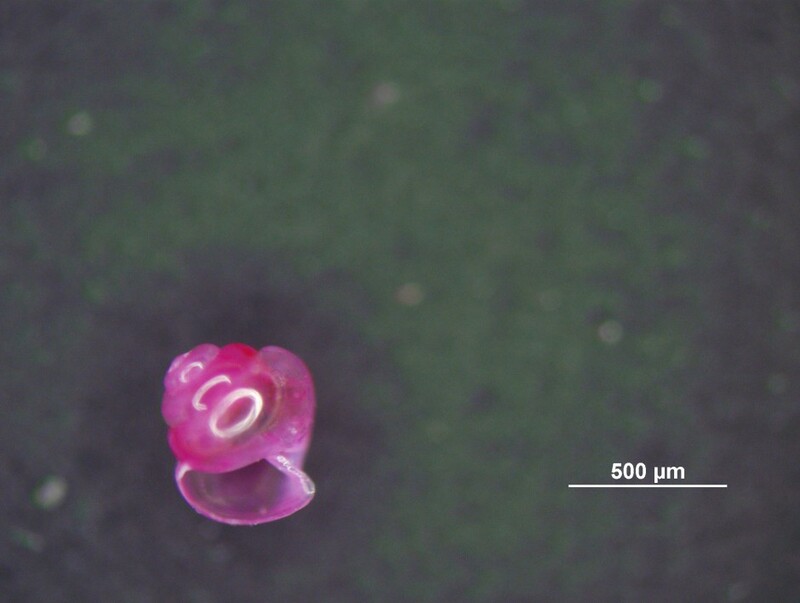 I use these tiny forams in my experiments to study the effect of changing environmental parameters, for instance OA. MSM 58 (SEPTEMBER 10- OCTOBER 7, 2016): BIOMINERALIZATION OF FORAMINIFERA Foraminifera undergo gametogenesis in phase with the lunar cycle. It has been proposed that the driving force behind this might be the change of the Earth’s Magnetic Field. My student, Charlotte Eich, was culturing planktonic foraminifera during this cruise to investigate this further. Culturing foraminifera on land is already a challenging quest, let alone on a ship in the middle of the Atlantic. We managed to culture quite a few foraminifera and are looking forward to the analyses back home in the lab. 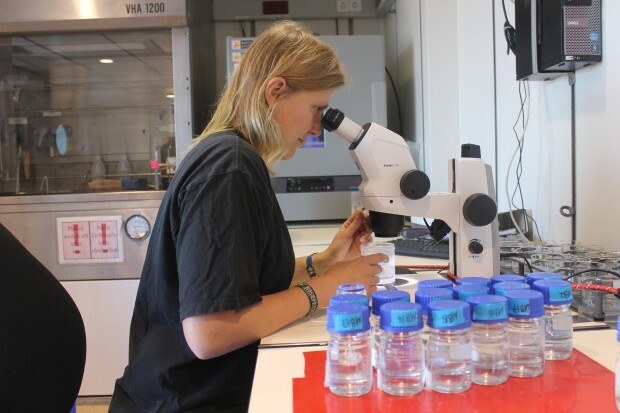 MSM 51 (FEBRUARY 1-9, 2016): BIOMINERALIZATION OF FORAMINIFERA The objective of the cruise was to investigate the influence of the Littorina Transgression on the environmental conditions in the Baltic Sea. This inflow of saline ocean waters into the back then fresh Baltic Sea took place 7000BC and reached an optimum 4500 BC, when the Baltic Sea was roughly 30% larger than it is today. While my colleagues were be busy taking sediment cores and performing seismoacoustic profiling of the seafloor, I was going to be taking box cores. I am using living foraminifera in incubation studies under higher temperatures under ample of food to induce reproduction. Then one foraminifera produces between 50 and 200 offspring, which are placed into experiments to study the biomineralisation process. MSM 45 (AUGUST2-21, 2015): BIOMINERALIZATION OF PTEROPODS & DISSOLUTION STATE OF PTEROPODS IN THE LABRADOR SEA The major objective of this cruise was to study how the Labrador Sea reacts on the melting of the Greenland ice sheet ad which influence the anticipated freshwater input has on the North Atlantic thermohaline circulation. The last glacial transition is a good time period to study this so we were looking to retrieve new sediment cores comprising high-resolution sequences. As the Labrador Sea is understudied with respect to zooplankton, I joined my colleagues to investigate the pteropods in the are. One major focus was to see whether the anthropogenically caused ocean acidification has already affected the planktonic mollusks, which are at high risk due to their fragile shells composed of aragonite, a material that is especially vulnerable to OA. 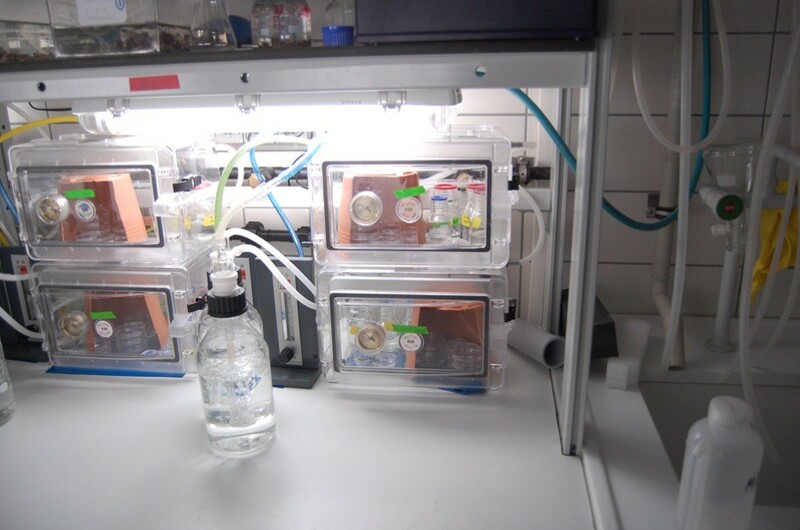 The other research focus was on the biomineralisation of pteropods: I used special inhibitors that target specific components of cell transport to study the uptake of ions needed to build the shell. Both research foci were completed successfully and I have already found some exciting results during data analysis.